Most people I know are always saying they didn't like a movie because it was different from the book. I just don’t agree with that line of thinking. I think a movie doesn't have to be a copy of the book, a movie has to translate the story from the paper to the screen, and the script doesn't have to be an exact replica of the conversations in the book. I mean, I get that people want to see what they read, what I don’t understand is that if a single thing changes in the movie, they will be saying they didn't like it because that specific scene was different from what they were expecting. From my point of view that is wrong, the book should just set the foundation to the movie for it to be adapted and improved so that the audience can enjoy it. A movie should present the book story and must draw in people to watch it, it has to be made in a way that it could be commercialized, and this implies an adaptation of the book itself. If the movie is exactly like the book, it wouldn't even make sense to waste money on the movie production, would it. 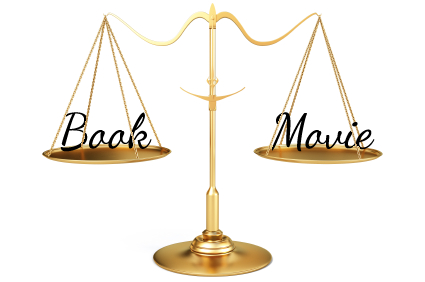 I feel misunderstood in this matter because no one seems to understand that the book and movie are two distinct things. So please folks, don’t judge a movie because it is different from the book, because if you never read the book and you saw the movie, you would probably love it. Share book reviews and ratings with Joana, and even join a book club on Goodreads.